Farm work, orchard and computer programming keep Jess and Doris Lionberger hopping. There must be things that Jess and Doris Lionberger cannot do. 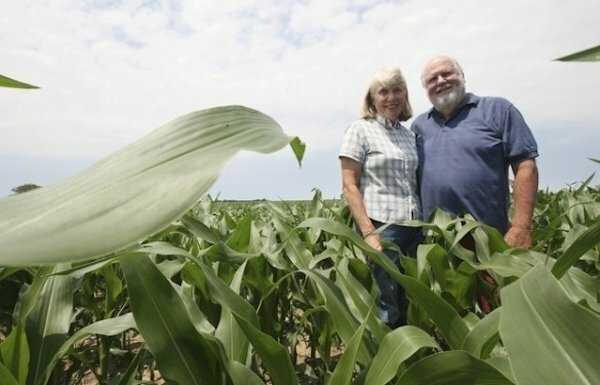 Brain surgery and rocket science spring to mind, but that still leaves a multitude of tasks the Dallas City, Ill., farm couple eagerly pursues and has mastered. Computer programming and applications, engineering design, the care and feeding of bean and corn acreage, marketing of commodities, biking, canoeing and apple pies are just a few of the activities that keep the Lionbergers' gray matter churning over. But, on a warm afternoon the peripatetic couple takes a few minutes from a busy lifestyle to offer a visitor homemade cookies and a walk-through of the life adventure that brought them to the 900 acres they farm with two of Jess' brothers. Jess grew up on the river bluff farm but was lured to the University of Illinois, where he opted for a degree in agricultural engineering. Somewhere in his junior year, he realized he needed a couple of credits in physical education, and after scanning the course selection catalog, he decided he would sign up for ice skating. At first glance, pirouetting over the ice might seem an odd choice for a burley farm kid who never strayed far from the Mississippi River. But Jess reasoned it was something he never had done. And besides, it was a good way to meet girls. Like so many other ideas, this well-thought-out plan worked out perfectly, and Doris and Jess met on a patch of ice. Romance followed, and then came marriage; and after 1972 graduations, the couple turned to life in the corporate world. Doris, a native Eureka, Ill., and Jess, headed for Akron, Ill., and a design engineering job manufacturing military aircraft tires. The couple built a new home and settled in for a long stay. "Goodyear was looking for engineers then," Jess said, "and because ag engineering has a lot of mechanical engineering in it, they brought me on where I joined a design team. It was pretty interesting because I had developed an interest in computers very early - before I went to college - and was reasonably proficient with it by the time I got to Goodyear. "Not too many of the engineers I worked with were as familiar with computer applications as I was, so I had a real advantage. I could do all the mathematical models and could produce designs in a fraction of the time that others required." Doris also took up a career and was developing computer applications for grain marketing, and soon was teaching those techniques to corporate clients and farming groups. But then came a call from Dallas City. Jess' father had developed health problems and it was time to return to the family farm. "We really weren't that disappointed about leaving the corporate world," Doris said, "because we had discovered the truth in the old saying that you can take the kid out of the farm, but you can't take the farm out of the kid." "Besides," Jess laughed, "I learned that I wasn't much on getting up early in the morning and going to my job. I'm not an early morning person and prefer to work on my own schedule, and by two or three in the morning, I'm really on a roll. I remember when I got home how it would really bother my dad when he showed up at our house at 7 a.m. to tackle some farm chore and I was still in bed." If Jess and Doris required a bit more sleep in those days, it was because their daily schedules were getting very full. There were two young boys to raise, marketing concerns to manage and computer programs to develop that often kept the two up into the small hours of the morning. There also was the old farmhouse, built in 1846, that required extensive remodeling. However, the two persisted and soon the days assumed a rhythm of their own. The farm took large chunks of the couple's time, but Doris still found space to drive a local school bus and refine her computer models that track and anticipate grain market trends. She now teaches that tool at local colleges and ag groups. Jess used his mechanical and computer skills to develop an automated grain handling system and embraced cutting-edge technology for farming. If this was not enough to keep them busy, Jess was busy writing customized programs for customers of the Burlington and Macomb, Ill., computer business he operated with one of this brothers. But, the farm still was the center of their business life. "We wanted to diversify, and that's when I began thinking how nice it would be if we had a few apple trees," Doris said. "We started pricing them and learned that if we bought 100 trees, we would qualify as a commercial grower and get a large discount. I figured we had a post hole digger, so how hard can some apple trees be?" Doris said. She and Jess soon were to learn how much time and effort the trees require, as their Almost Eden grew a local reputation. That reputation was bolstered by the popular apple pies Doris would bake in her kitchen - often working until early in the morning - and by the apple cider they produced. Although she is a marketing maven, Doris opted for a pretty basic means of moving her apple products. During pie season, she loads up a refrigerator in the house's exercise room with pies and stacks jugs of juice nearby. Customers simply leave money in a nearby coffee can, and Doris reports it is not unusual for the couple to be awakened by the sound of an idling 18-wheel diesel truck as over-the-road drivers stop by to pick up a pie. Farms and pies, computers and marketing all mean a lot of work, but the Lionbergers still found time to relax - although that relaxation also might seem a bit demanding. Both have embraced biking, and a striking addition to their comfortable home has been converted into an exercise room boasting eight bikes of various designs. Jess logged 12,000 miles in his first year with the sport - including a long ride across Iowa to join RAGBRAI. There are seven grandchildren in the Mediapolis area who need to be spoiled, and each winter, Doris and Jess become snow birds and head to Florida for even more biking, as well as canoeing on area rivers, hosting dinners for other Midwest expatriates.